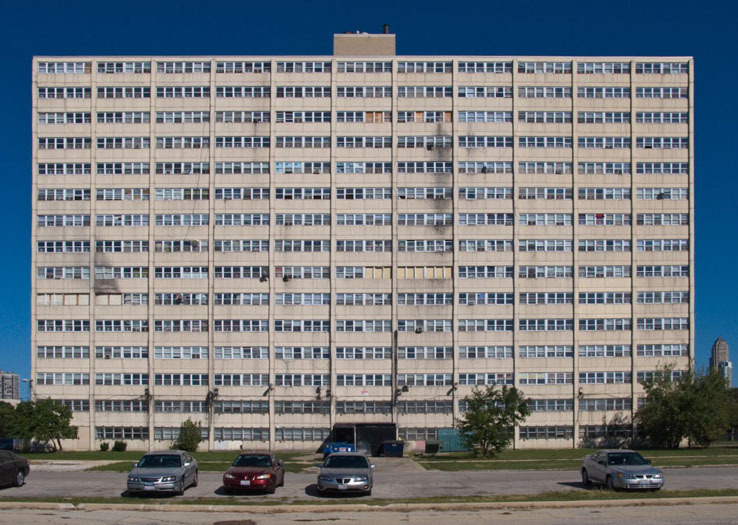 1230 N. Burling St. was a legendary building, not just because it was the last of the notorious Cabrini-Green high-rises to be demolished, but also because it was the first public housing building in American history to be fully managed by its tenants. 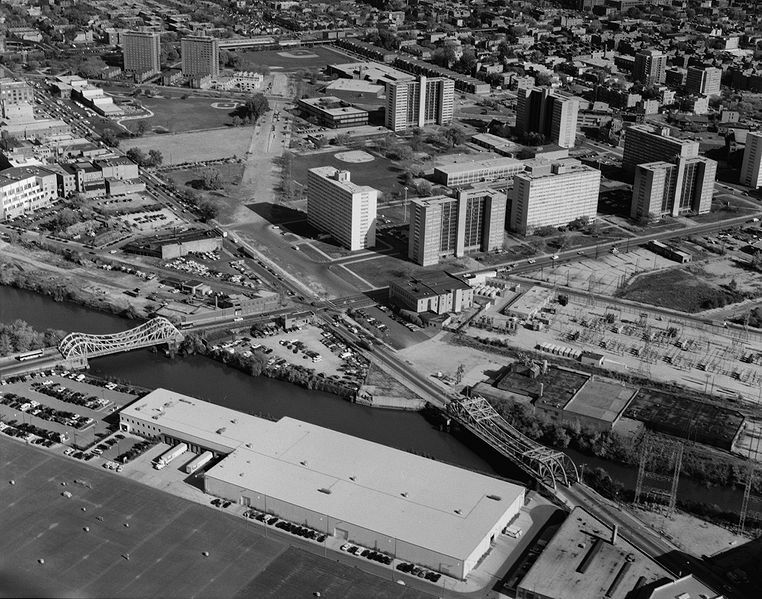 For years, the residents of 1230 N. Burling held out against the crushing tide of the Chicago’s fervor to eradicate high-rise projects. Finally its fate was sealed, its last tenant, Annie Ricks, moved out on December 9, 2010, and the demolition was scheduled for April of 2011. 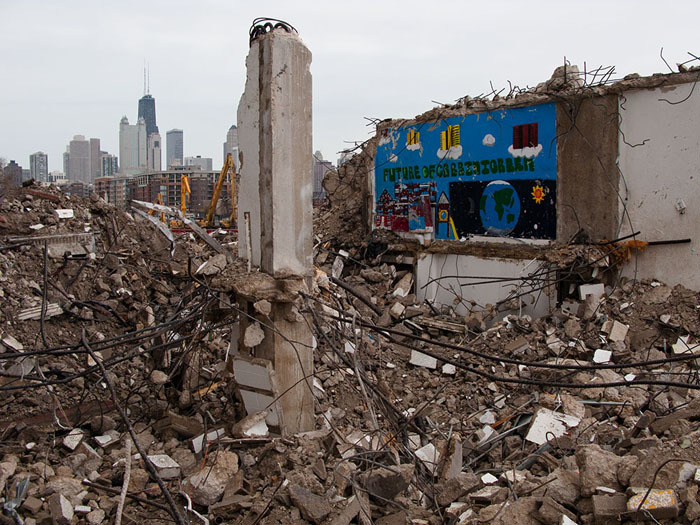 From the 26th floor of the nearby Montgomery Ward tower, artist, teacher and Chicago transplant Jan Tichy watched history unfold (or rather, crumble under the weight of wrecking balls) at the Cabrini-Green site. At the time, Tichy was commissioned to set up an installation in the Montgomery Ward tower, designed in 1972 by Minoru Yamasaki, the architect of the World Trade Center in New York as well as the Pruitt-Igoe public housing complex in St. Louis. Tichy knew the history of Pruitt-Igoe, which was both one of the most celebrated public housing developments in the country when it opened, and one of the first to be declared a failure. In 1971, just 15 years after opening, the first buildings were imploded; by then, Pruitt-Igoe was mostly a vacant ghetto. 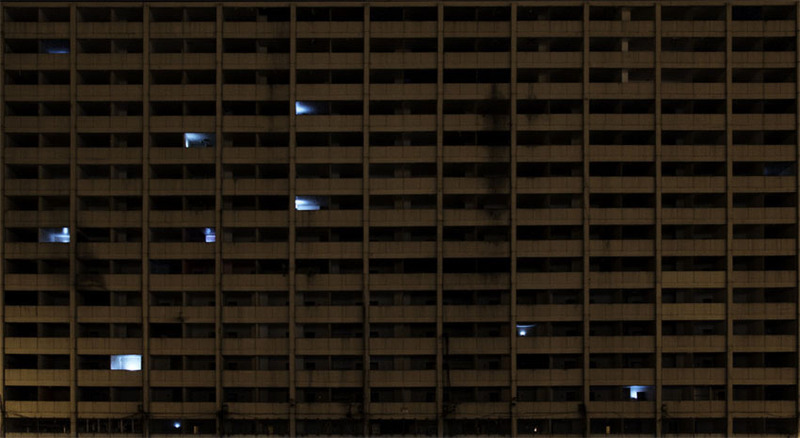 Images of the crumbling, 11-story buildings resonated in the national media as the signs of a failed American public housing experiment. That demolition was a clarion call for what was to come for massive public housing projects across the country. Tichy began working with four youth-oriented organizations in the Cabrini-Green area, on the Near North Side of the city: Cabrini Connections, Marwen, After School Matters, and the Queen’s Brigade Marching Band. 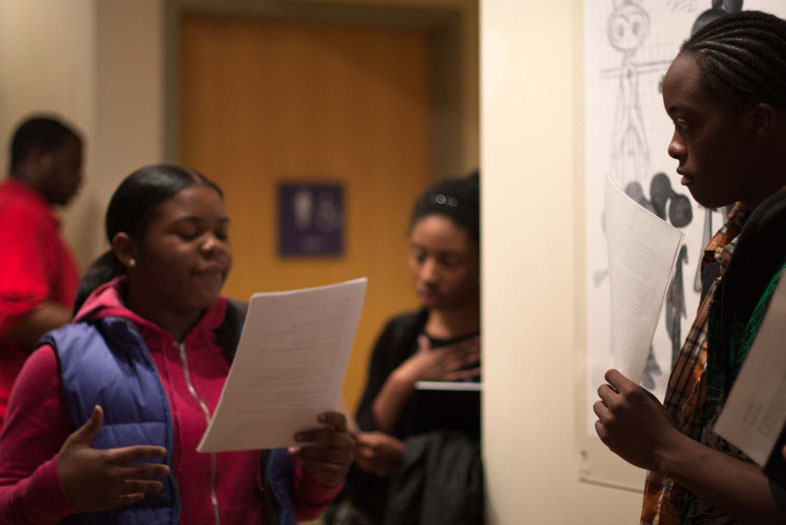 He and his students from the Art Institute conducted three-day workshops with the children and teens in these programs, talking about the history, social and political issues of Cabrini-Green, abstract and public art involving light and spoken-word poetry. The kids were then challenged to write poems reflecting on Cabrini-Green and notions of home, neighborhoods, and community. Some of the kids had grown up in Cabrini-Green, while others were learning about the housing project for the first time. I have seen great things and I have seen scary things. I have see people die from these gang fights. 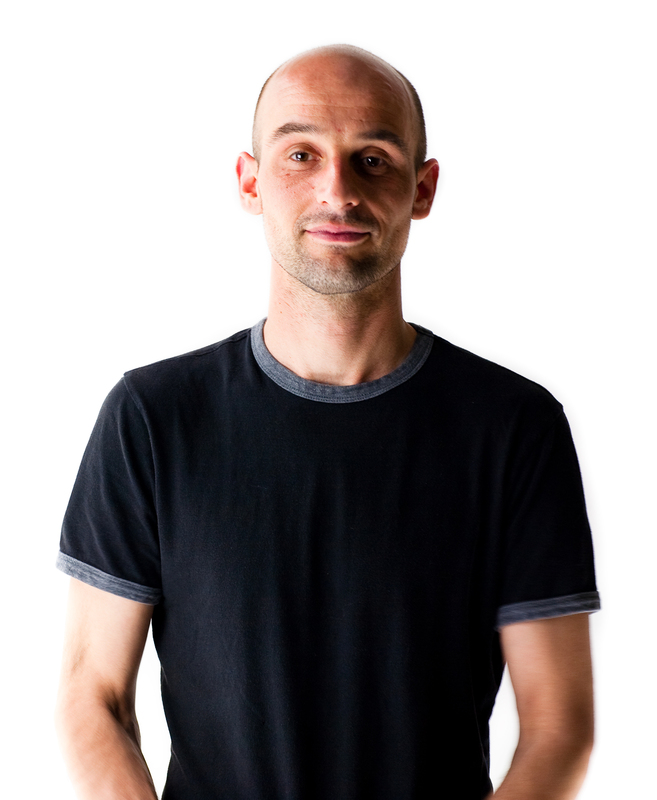 Tichy and his students recorded 110 kids reading their poems into software that programmed a connected LED light to blink to the rhythm of their speech. They also made 24 recordings of the sounds on site at the building before the demolition. Next, Tichy’s team installed the lights into rugged metal boxes painted orange. Two days before the demolition at 1230 N. Burling began, they installed a box into each of the apartments in the building. The lights were programmed to “wake up” at 7:00PM every night, blink their poem, pause for two to 10 minutes, and then repeat, until 1:00AM. 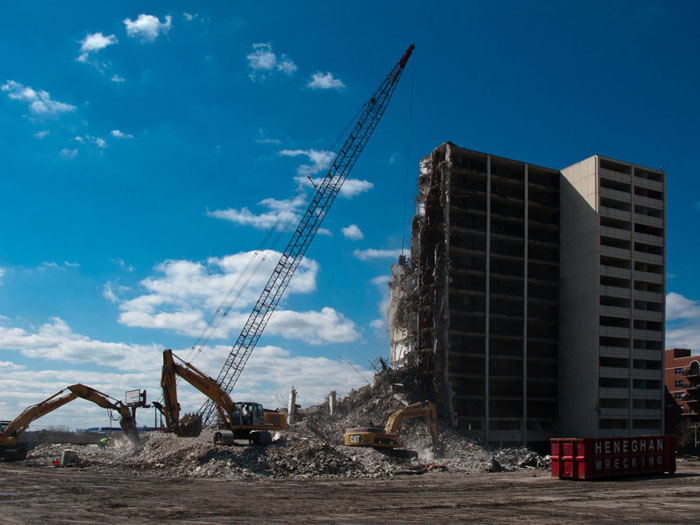 The entire demolition, from day one, was filmed non-stop and featured as a 24-hour live feed on the Project Cabrini Green website. Anyone could tune in to watch bulldozers and wrecking balls at work during the day, and the LED lights flashing at night. The feed was also projected at the Museum of Contemporary Art throughout the demolition. The visual results were captivating. At times, lights flashed in isolation in different parts of the building, as if trying to converse, at other moments a whole chorus of light voices would explode throughout the building. Some illuminated brightly-colored apartment walls. To passers by unaware of Tichy’s project, the scene must have looked confusing. Tichy said some observers assumed there were electrical issues in the building. To some former residents, the bright flashes in dark windows recalled the terror of sniper shootings. “I think that is the power of abstract art, it allows for widening your perspectives and thinking about things in different ways,” Tichy said. In the daytime, Tichy would come to the site to retrieve any boxes he could find in the rubble; several survived intact and are now part of ongoing exhibitions of the project. Since the live “performance” of Project Cabrini Green, Tichy has not disengaged from this work. The project website features a simulation of the building with flashing lights; clicking on apartment buildings brings up the individual light and the voice of a child reading his or her poem. Video of the lights in action, as well photo galleries are all available on the site. The project’s Facebook page is alive and well with conversations among former participants and those newly interested. At gallery and museum exhibitions of the project, Tichy installs a screen with the 700-hour video of the demolition to run continuously for a month. Surviving light boxes, a model of 1230 N. Burling and the texts of all 134 poems go on display as well. Most recently Project Cabrini Green was featured in New York. In January, Chicagoans will have a chance to see the installation at the Elmhurst Art Museum. Watch some of recording of the flashing lights inside 1230 N. Burling.